Bringing you the final part of the Forever F.I.T. Programme. Vital5 incorporates Forever Living’s cornerstone product, Forever Aloe Vera Gel, with four synergistic supplements. 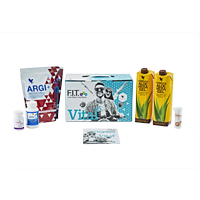 This unique product combination will provide you with essential vitamins and nutrients for overall wellbeing, and it’s the perfect product to integrate into your daily fitness routine.